SKK mobile unveils its new mobile phone quad-core lineup, and the mobile competition in the Philippines is just getting better and better. 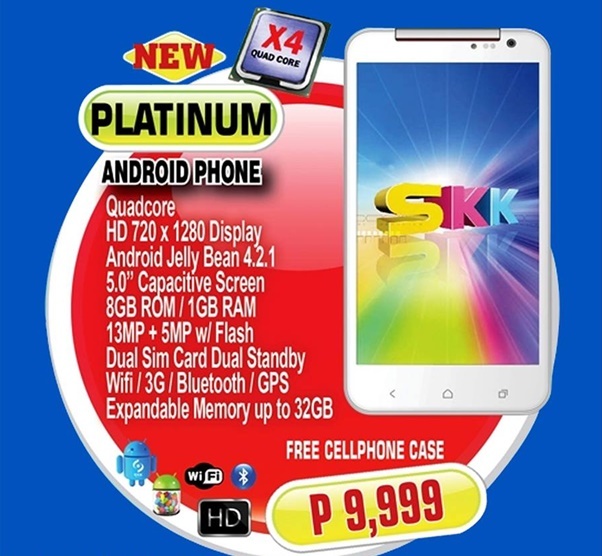 SKK mobile platinum has 5.0 inch screen and a 1.2Ghz Quad-Core processor, so playing HD movies and HD games are not a problem, although SKK mobile platinum is a China made phone, we can expect a quite good build on SKK mobile platinum, and by the way Platinum is just part of the name and not the cover itself. Priced at Php9,999 that's almost Php10,000. Available in the Philippines nationwide. At the price of Php9,999. We don't know for sure if its worth it until we get a handful review of the phone, price list is almost the same as Cherry Mobile Blaze 2.0, and O+ Plus 8.15 Android phone. Soon enough we could get to know on how to root SKK Mobile Platinum. Php9,999 Suggested Retail Price | Available in online stores, and authorized reseller nationwide.